Don’t kiss the frogs! Use this tool to evaluate employee engagement vendors and find a prince of a partner. Is your employee engagement partner providing the value it should? You’ve put your trust in an employee survey company. You expect this hired expert to improve efficiencies, provide quality service and tools to make your job easier, and help improve your organization. But have you placed your trust, your organization, in the hands of the right partner? Discover the 10 signs it’s time to move on. 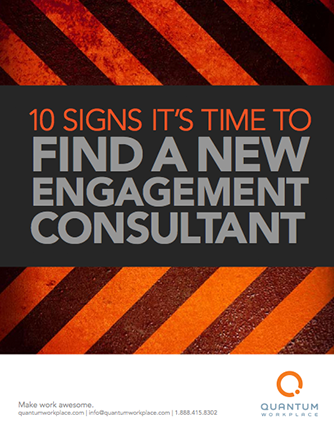 This ebook will help you evaluate your current or potential partnership. It’s based on the stories we hear from organizations like yours every day. Bonus! Also included in the ebook, The Engagement Consultancy Report Card is a quick, easy way to evaluate your partner on the factors that matter most, such as credibility, education, value, efficiency, technology, accountability, and more. As you evaluate your partner or a potential partnership, it’s not just a survey project that’s on the line. It’s your credibility. It’s your investment. And it’s your culture and people. Get your copy today!